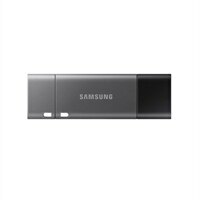 Samsung DUO Plus MUF-128DB - USB flash drive - 128 GB - USB 3.1 / USB-CDouble up on convenience. The DUO Plus is a Type-C drive with a super-useful Type-A adapter. Eliminate worries as the intuitive integrated Type-A adapter works with your older devices. You can flexibly move data and free up space with superior speed and performance. Double up on convenience. The DUO Plus is a Type-C drive with a super-useful Type-A adapter. Eliminate worries as the intuitive integrated Type-A adapter works with your older devices. You can flexibly move data and free up space with superior speed and performance.